Faroe Islands is Northern Europe, island group between the Norwegian Sea and the North Atlantic Ocean, about half way between Iceland and Norway. It is an archipelago of 17 inhabited islands with a population of 50,000, and one uninhabited island, and a few uninhabited islets; strategically located along important sea lanes in northeastern Atlantic; precipitous terrain limits habitation to small coastal lowlands. 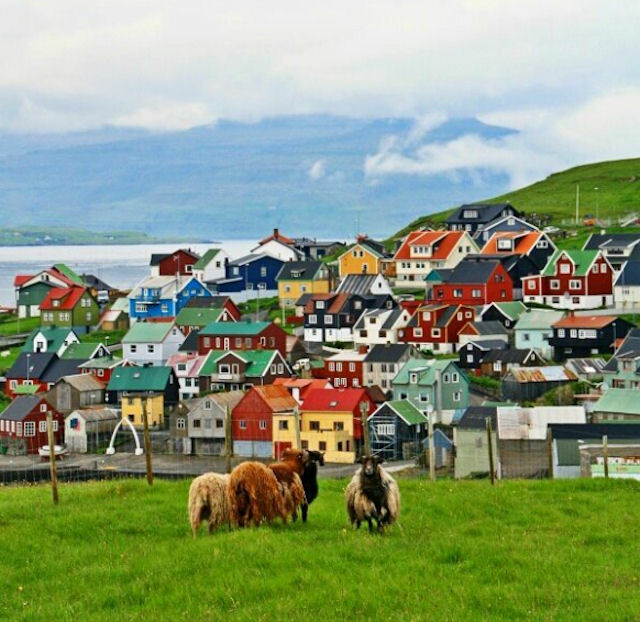 ?The islands are home to about 80,000 sheep, which play an important part in the Faroe culture and even lent the archipelago its name: "Føroyar" translates literally as "the islands of sheep." Between 1035 and 1814, the Faroe Islands were part of the Kingdom of Norway. In 1814, Denmark won control over the archipelago together with two other former Norwegian regions, Greenland and Iceland (the latter acquired independence during WWII). The Faroe Islands are not part of the EU or the Schengen area and lead a trade policy of their own. Exploration activities indicated that there could be undiscovered oil and gas resources. The home-rule Government has full authority over hydrocarbon exploration in its territory and attempted to move toward greater independence from Denmark by increasing exports of fish products. The islands have no significant identified mineral resources. After over 200 years under the Danish crown, the Faroe Islands seem to be paving the way for possible independence. The Danish territory is set to hold a referendum on a new constitution, which is seen as its first step towards separation from Denmark. The referendum on the Faroese constitution was scheduled for 25 April 2018, in preparation for a possible national ballot on separating from Denmark. The Government aimed to ensure as broad support as possible for the new Faroese constitution, both in the Parliament and among the Faroese people. Leaders of both coalition and opposition parties in the Faroes had been working to find consensus, based on a proposal that had been under development for several years. Denmark accepted the Faroes’ right to a constitution, so long as it did not clash with its own. Yet the draft had no clear mention of Denmark and offers paths to more autonomy. The Government had originally intended for the constitution to be put to a referendum before the end of 2017. It was then planned for 25 April 2018. The proposal would first be submitted to the Parliament when it convened on 29 July for its 2017/18 session. A six-month period would then be required from the time the proposal is adopted in the Parliament until the referendum is held. "The Faroese constitution will define our identity as a nation and our fundamental rights and duties as a people, including our right to self-determination. It will also be a safeguard against the abuse of power. This will be clearly reflected in the requirement that the Faroese people must be consulted by referendum on questions related to further independence from, or further integration with, Denmark. The same will also be the case in relation to membership in supra-national organisations, such as the EU. The Faroese constitution will move the ultimate decision-making power from the Parliament to the people on such fundamental questions. This will be a triumph for the Faroese people and for democracy in the Faroe Islands”, said Prime Minister Johannesen. To no great surprise to observers of the Faroes’ complex politics, the referendum was quietly postponed as the various parties in the country’s parliament, the Logting, couldn’t agree on the wording of the new constitution. Furthermore the postponement was not even announced on the official Faroe Islands government website. In the late 19th century, the Faroese nationalist movement united the people of the Faroe Islands around a cultural identity expressed in language, literature and culture. The national movement regarded the Faroe Islands as a nation, and in fact the people of the Faroe Islands have never thought of themselves as Danes. However, the movement disagreed about how radical the political objectives should be with regard to the relationship with Denmark. The result was that the movement split into two opposing political factions. A conservative or moderate wing, the Unionist Party, was formed in 1906, and a radical wing, the Independence Party, was formally formed in 1909. These two opposites formed the dividing line for subsequent political parties. Faroe Islands has been an autonomous province of the Kingdom of Denmark since 1948, but there is increasing demand in the Faroe Islands for more. Over the years the Faroese have taken control of most matters except defence, foreign affairs and the legal system. Politically, the present Faroese Home Rule Government has initiated a process toward greater independence from Denmark, if not complete secession from the realm. In that respect, agreement on how to phase out the Danish subsidy plays a crucial role. Because anticipated offshore hydrocarbon resources have not been realized, earlier Faroese proposals for full independence have been deferred; Iceland, the UK, and Ireland dispute Denmark's claim that the Faroe Islands' continental shelf extends beyond 200 nm. Faroese autonomy in foreign relations is provided for by a treaty between the Faroe Islands and Denmark, the For­eign Policy Act from 2005. The Foreign Policy Act gives full pow­ers to the Government of the Faroes to negotiate and conclude agreements under international law on behalf of the Kingdom of Denmark where such agreements relate solely to matters for which internal powers have been trans­ferred to the Faroese Authorities. The Faroe Islands participate actively in the multilateral Nordic Cooperation established by the Helsinki Treaty. This treaty has established close cultural cooperation among the Nordic countries, with a common labour market, no passport control, as well as providing for close cooperation regarding social services and access to schools and universities. The Faroe Islands are recognised as a self-governing entity in the Nordic Council of Ministers, which provides for active participation of the Faroe Islands in their own name. There is full political consensus in the Faroe Islands for attaining full membership of this organisation. The Danish block grant currently makes up 3.3% of the Faroese GDP, compared to 11.2% in the year 2000, figures from the Ministry of Finance show. It is a common misconception that the Faroe Islands are largely financially dependent on Danish subsidies.The Faroese economy, however, has never been more self-sufficient. The block grant, an annual subsidy from the Danish Government, currently amounts to 642 million DKK (86 million euro). The Faroese Government has a national budget of 4.944 m DKK in 2017, in which the block grant funds 13% of spending. This is a decrease of 15.7% since 2000, when the block grant made up 28.7% of the budget. The population of the Faroe Islands is largely descended from Viking settlers who arrived in the 9th century. The islands have been connected politically to Denmark since the 14th century. A high degree of self government was granted the Faroese in 1948, who have autonomy over most internal affairs, while Denmark is responsible for justice, defense, and foreign affairs. The Faroe Islands are not part of the European Union. The unicameral Faroese Parliament or Logting haws 33 seats; members are elected by popular vote on a proportional basis from the seven constituencies to serve four-year terms. Elections were last held on 19 January 2008 (next to be held no later than January 2012). The election results: percent of vote by party - Union Party 21%, Social Democratic Party 19.4%, Republican Party 23.3%, People's Party 20.1%, Center Party 8.4%, Self-Government Party 7.2%, other 0.7%; seats by party - Republican Party 8, Union Party 7, Social Democratic Party 6, People's Party 7, Center Party 3, Independence Party 2. In early 2008 signs of an impending slowdown in the Faroese economy became apparent. The main difficulty lay with the fishing industry coming under pressure from smaller catches combined with historically high oil prices. Though oil prices have come down, reduced catches of especially cod and haddock have strained the Faroese economy. GDP growth was 0.5% in 2007-2008, but inflation was 4.7%, leading to a drop in real GDP. A contraction in all sectors except the public sector is expected for 2009. The slowdown in the Faroese economy follows a strong performance since the mid-1990s, with annual growth rates averaging close to 6%, mostly as a result of increasing fish landings and salmon farming and high and stable export prices. Unemployment was insignificant and reached its lowest level at 1.2% in the first half of 2008 but increased to 3.3% in April 2009 and is rising. Most of the Faroese who emigrated in the early 1990s (some 10% of the population) due to the economic recession have returned. The positive economic development helped the Faroese Home Rule Government produce increasing budget surpluses that in turn helped to reduce the large public debt, most of it to Denmark. However, the total dependence on fishing and salmon farming makes the Faroese economy very vulnerable, and the surpluses turned to deficits in 2008; a deficit of $100 million is projected for 2009. Initial discoveries of oil in the Faroese area give hope for eventual oil production, which may lay the basis for a more diversified economy and thus less dependence on Denmark and Danish economic assistance. 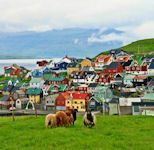 Aided by an annual subsidy from Denmark corresponding to about 6% of Faroese GDP, the Faroese have a standard of living comparable to that of the Danes and other Scandinavians.